SMS Wonder Boy (USA/Europe) in 43:05.02 by AngerFist. In this first game in the popular Wonder Boy series, Tom-Tom is out to rescue his beloved girlfriend Tanya from the wicked monster Drancon. Our nearly naked hero must travel through a variety of different environments, using a hatchet and several powerups to defend himself against the dangerous enemies along the way. 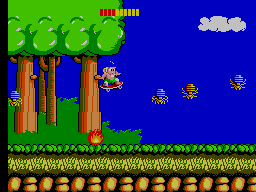 The game was later ported to the NES (with altered graphics and music) as Hudson's Adventure Island. AngerFist runs, jumps, shoots, and shreds his way to Drancon, beating the game in a little under 45 minutes.